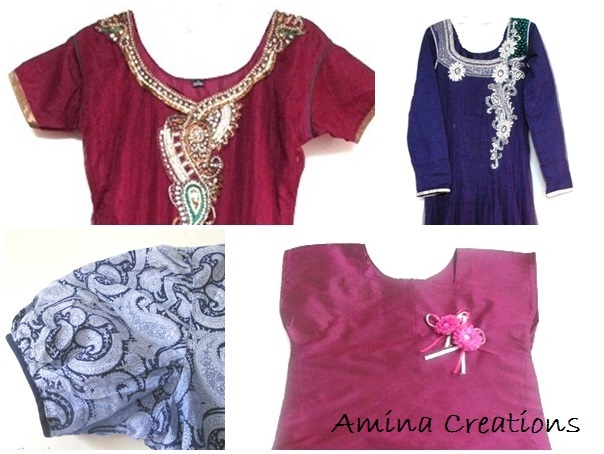 There are several types of sleeves which can be added to a top, kameez, kurti, blouse, etc. Here I am sharing some basic types of sleeves patterns along with their construction and method. Normal sleeves, Magyar sleeves, bell sleeves, long sleeves and puff sleeves are those whose construction and method of cutting and stitching is discussed in this post. Take an inch tape and place 0 at the shoulder joint. Measure till you reach the wrist. This is the sleeve length. At this point measure round arm and note down the measurements. Similarly find the elbow length and round elbow. Using your measurements calculate the above and mark on the cloth. 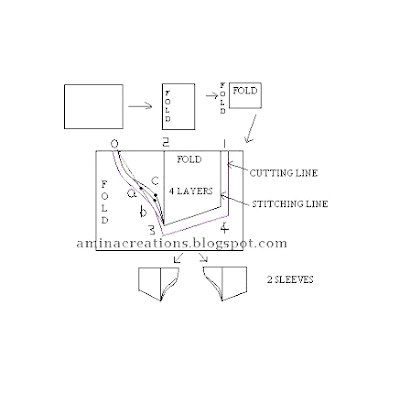 The cloth has to be folded in the reverse as shown. Mark the measurements on the cloth and draw the curve from 3 to 4 passing through b. Cut the cloth leaving 1” allowance along the sides and wrist and ½” allowance at the arm holes. After the sleeves are cut, draw an inner curve in the front part of each sleeve and cut accordingly. Once the sleeves are cut, double fold the extra cloth along the wrist end and stitch. The sleeves are now ready to be stitched to the Kameez or Top. 2 to 3 – 1/4 chest + 1 and 1/2"
Magyar sleeves are not cut separately and stitched to a dress. 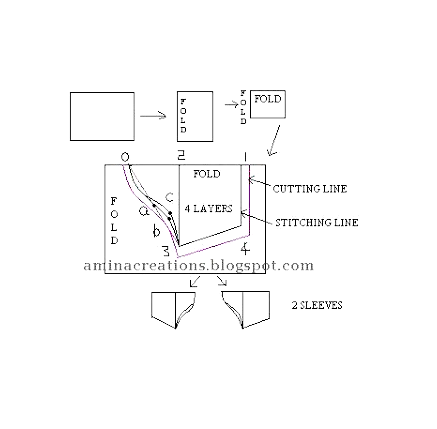 While cutting the kameez or top, the measurements given above are marked and the cloth is cut. For a Magyar sleeve, take the cloth required for stitching the kameez and fold the cloth as shown. Mark the measurements of the kameez or top on the cloth and use the above measurements for marking along the sleeves. Cut the cloth leaving 1" allowance along the sleeves and sides and 1/2" along the neck. Whether you are making a kameez, top, or blouse, the method of stitching a Magyar sleeve is mostly the same. Here I have kept the sleeve length short, but you can modify it according to your preference. Place 0 of the inch tape at the shoulder joint and measure the sleeve length till the point where you want the sleeves to end. (Usually puff sleeves are shorter). Measure round arm at this point and note down the two measurements. Open the cloth and fold in the reverse as shown in the picture. Using the body measurements calculate and mark on the cloth. Draw the curves joining 1 7 and 6 and 3 and 5 as shown. Cut the cloth leaving 1” allowance at the sides and ½” allowance at the arm holes and near the round arms. After the sleeves are cut, cut a deeper arm hold on the front part of each sleeve to coincide with that of the arm hole in the front part of the kameez. At the point where the sleeve ends, an elastic of length = round arm can be stitched and a picot can be done. Alternately, the ends can be pleated such that the length will reduce to that of the round arm and a thin strip of cloth can be stitched. As you attach the sleeves to the arm holes of the kameez, make sure to stitch the pleats near the shoulder joint of the kameez. Take an inch tape and place 0 at the shoulder joint. Measure till you reach the wrist. This is the sleeve length. At this point measure round arm and note down the measurements. Similarly find the elbow length and round elbow. Using your measurements calculate the above and mark on the cloth. 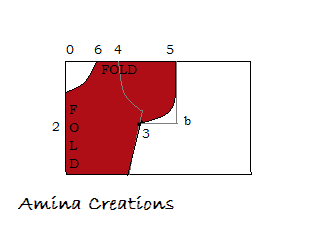 The cloth has to be folded in the reverse as shown. Mark the measurements on the cloth and draw the curve from 3 to 4 passing through b. Cut the cloth leaving 1” allowance at the sides and wrist and ½” allowance at the arm holes. 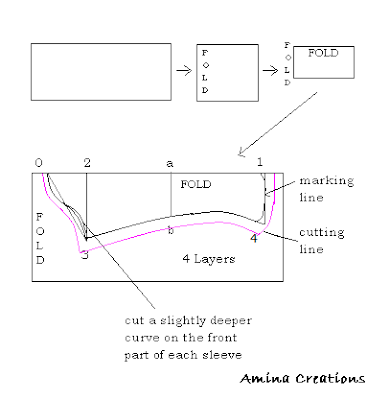 After the sleeves are cut, draw an inner curve as shown in the front part of each sleeve and cut accordingly.